In the automobile, electrical connections are made in two ways. The most common is the "connector." These are mechanical devices that hold two ends of a wire together firmly so that current can flow. The variety of connectors is endless, of course, but some are notoriously ineffective. The other means of connecting two or more wire ends is by soldering. Soldering is the most effective of all electrical connections. Solder connections are permanent and mechanically strong, thus making them less prone to failure than any other connections. You need a soldering iron or gun, or both. Since most solder jobs involve only one or two connections at a time, we recommend getting a gun. A gun's advantages are: instant heating, ease of use and (usually) several heat ranges. The only disadvantage of a gun is its rather short "duty cycle." Its tip tends to overheat or mechanically break down if left on for long periods, so for doing many joints an iron is best. 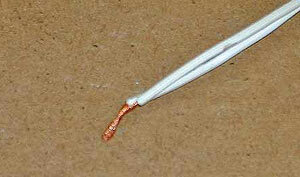 For our example, we'll be soldering the two ends of this wire together. You also need solder. There are two general types of solder, electrical and HVAC or plumbing. Electrical solder usually has its own flux (a material that aids flow) inside. The flux will not do long-term damage to the connection. Plumbing solder, by contrast, utilizes harsh acids as a flux. Using such solder on an electrical connection will ultimately cause it to corrode. Always use electrical solder for wiring! The strands of the wire are twisted together. Step 1. Prepare your wire ends for soldering. If possible, twist them together. If you can't do so they must be held tightly together during the soldering process. The use of hemostats or other gripping devices will help in these situations. 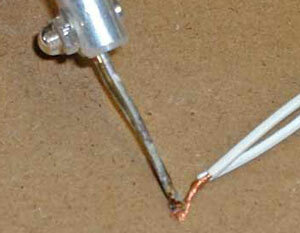 Hold the tip of the soldering gun to the wires for a few seconds to heat them. Step 2. Put the heating tip of the gun/iron on the wires. Heat them for a few seconds. Step 3. Touch the solder end to the wires, NOT TO THE HEAT TIP. You want the solder to melt into the wires and it won't do so until the wires reach melting temperature. 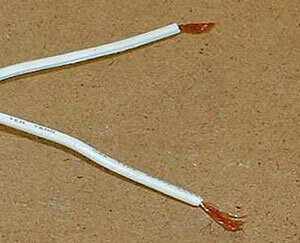 Touching the heating tip will melt the solder but it will not necessarily flow into the wires. Touch the solder to the heated wires (not to the tip). Step 4. 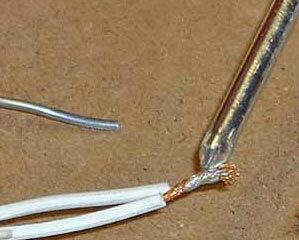 Allow the solder to flow completely into the twisted wires; then let off the heat. When the joint has cooled, look it over carefully. Make sure the solder flowed all through and that the joint is clean, shiny and impossible to break loose. You can wrap the new joint with electrical tape or put a piece of shrink tubing over it, whichever is appropriate. 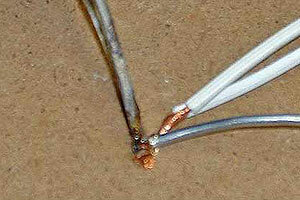 After the solder flows over the wires, remove the heat.